Another year has rolled around to the seventh anniversary of blogging. In those seven years I have written 495 with this post now being Number 496. It’s been a slow year of 45 published posts, especially when you consider that this time last year I was reporting a really productive year of 88 published posts over the previous 12 month period. 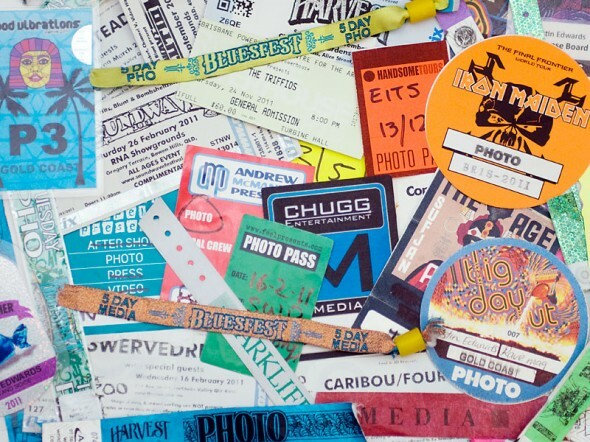 There was a point in the middle of last year where I did get completely up-to-date but have fallen behind once again, so much so that although it’s nearly the end of March I still haven’t put together my round-up of 2012 (or even taken a photo of my 2012 photo passes and tickets, hence last year’s photo). Currently there’s a backlog of more than 20 posts that I’ve got to put together. A lot of those are multi-part festival posts and, for the majority, drafts consisting of extensive notes have been prepared and just need to be formed into something readable. This entry was posted on Sunday, March 24th, 2013 at 5:09 pm. It is filed under Music Photography and tagged with Brisbane, Justin Edwards, music, Music Photography, Photos, Seven, This Is Not A Photo Opportunity. You can follow any responses to this entry through the RSS 2.0 feed.